An extensive investigation of two women who could hear and feel electromagnetic fields from the wiring and appliances in their homes. The scientists tested one of the women in a controlled laboratory at a university. They also thoroughly investigated one house and the buried wiring and pipes around it to locate stray electricity with enthusiastic participation of the local utility. They were able to drastically reduce the electrical problems in the house and the woman�s symptoms. This happened in 1963, but is fully relevant today. This paper is more of a chronicle of the author�s encounter with quite a revolutionary finding. It deals with the cause of low frequency, low energy AC fields and their effect on some persons. The work done to locate the source and reduce the fields is outlined. It is pointed out that the human implications and medical and clinical aspects should be of important interest. While we were in the Biological Sciences Department of the University of California Santa Barbara, we became interested in a noise problem in a newly constructed house. The location was an unusually quiet one, so we decided to look for electric fields first to see if we could trace them to some metal which might be set into vibration by the fields. To start with, a high gain battery operated tape recorder was used. The microphone was replaced with a pick-up coil or loop. The search coil picked up very strong harmonic frequencies from the 60 cycle electric service, telephone service, gas service, water service and metal in the heating system. A contact type stethoscope was then used in the strongest field area to find out if any metal was vibrating. There were no audible vibrations of these frequencies. The woman of the house was the only one bothered by the noise. She described the same noise I was hearing on my pick-up loop! The �impossible deduction� was made that perhaps this woman could hear these alternating current fields without conversion to audible sound waves. A simple test was made. The tape recording was played back into the coil used for pick-up instead of the headphones. She instantly remarked, �You mean you cannot hear that?� No audible sound could be detected coming from the coil, yet she could hear it! A second test was made. I connected a low power sweep frequency generator to the water pipe at another ground, both about 100 feet from the house. I did not tell her this, but she remarked that there was a peculiar noise like a barking dog. I turned on the pick-up equipment in the house and heard the same signal from the generator. The description was accurate as it did sound like a barking dog! There was not enough power to vibrate metal in the house, and there was no possibility of an audible signal reaching the house. The places she indicated as the noisiest and quietest were checked and verified with the equipment. A test of this person was set up at a seminar at the university. A special audiometer test was devised to try to prove the sensitivity and frequency range under controlled conditions. Instead of the regular headphones, a pair of coils were made to place over the subject�s ears and the signal was fed to the coils. When she entered the seminar room, she said the noise was extremely bad. The electromagnetic search coil did not indicate very strong magnetic fields. When the subject placed the coils over her ears, and when the audiometer was turned on but the key left open, she said the noise from the coils was intense. Because of this high background noise tests could not be made. In fact, a control subject could hear a small amount of audible tone from loose coil turns vibrating. She could not because of the field background. The last test was for sensitivity to electrostatic fields. It had been assumed at this time that electromagnetic fields would be the most logical as they would penetrate the body. When the subject was placed between two metal sheets and AC voltages were fed to them, she was able to correlate them with on and off. However, it was not possible to avoid a very weak audible signal from the metal as they acted as a weak electrostatic speaker. If the subject could not hear the weak audible signal because of the strong background electrical noise, we might assume that she was most sensitive to about 3000 cycles from this test. A later checking of the troubles at the demonstration revealed what had happened. The trouble was that the subject was also sensitive to electrostatic field conditions. An electrostatic probe consisting of a metal disk on the end of a polystyrene rod was connected to the amplifier. In checking the lecture hall, the probe picked up very strong electrostatic fields mostly from a large number of fluorescent lamps. The coils connected to the audiometer were checked with the probe and it was found that they were radiating a very strong electrostatic field including the noise from the masking oscillator in the audiometer, even though the masking oscillator switch was not closed. The coils were delivering the masking noise electrostatically because they were not shielded and grounded. The new probe was taken to the house, and in going over the house a different pattern was presented. All the AC operated equipment in the house had these electrostatic fields about them. The telephone was also radiating. For some years the subject at times had been able to answer the phone before it rang. The probe was tried during an incoming call and it was found that the phone radiated connection noises just before it rang! At times, she has heard phone conversation when near the wires. She was able to hear tape recorded music fed to a loop of wire on the floor. She also said that at times she could hear extremely high pitched Morse code. A long wave marine receiver was obtained and it was found that she was hearing propagated radio waves from long wave low frequency stations. These are continuous wave, unmodulated stations with a carrier in the audio frequency spectrum around 15,000 cycles. Realizing that the electrostatic fields are easily shielded with grounded metal shields, an experiment was tried. A ground wire was brought into the house and a sheet of aluminum foil was placed around the subject�s head. As soon as a wire from the foil was connected to the ground wire the noise level dropped. The probe showed the same result. The open wire low voltage secondary of the door chimes was producing a lot of noise in the kitchen. When one side of the low voltage secondary was grounded, the noise level in the kitchen dropped. Grounding the refrigerator and freezer case also helped. Telephone noise was reduced when the wires were shielded. We investigated a second case almost identical at a home in Monrovia, California. The same kind of conditions were producing strong electrical fields. The woman of the house was the only one hearing them. The same tests revealed that she was less sensitive than the first subject, but the fields in this house were stronger. These two women visited each other with interesting results. When the Monrovia woman visited Santa Barbara, she could hear the noise in this house, but not as strong as in her own home. With the Santa Barbara woman visited Monrovia, she found the noise so bad she had to talk loud to override the background noise. She could only stand it in the house for a short time. The first woman suffered very much from the effects of these fields. The overall body effect, feeling and pain was worse than the hearing sensitivity. This resulted in much loss of sleep and rest and aggravation of nervous conditions. She became seriously ill with �shingles� which is a nerve ending disease. Her doctor had to remove her from this house for some time to overcome it. The feeling sensation she had from these fields suggests sensitivity of sensory nerve endings in the skin. The special receptors for pain maybe involved. She also described throbbing sensations of a few cycles per second. The equipment revealed sort of beat note pulsations of a few cycles per second. Determination of the reason for this hearing sensitivity requires much research. Some simple crude experiments were made. An electrostatic probe in a closed class tube was connected to a source of variable frequency electrostatic energy. This was used to check teeth and fillings. A small open core coil with iron core was connected to a source of audio frequency current to produce limited fields of a few inches. These tests revealed that the teeth did not seem to be the reason for the hearing sensitivity. It was found that the left side of the head was most sensitive. When the subject was ill with the shingles, it was the left side of the face that was most affected by the pain, swelling etc. It would be very interesting to test deaf individuals with the small coil to see if any of them could hear the field. This poses a possibility of a new type of hearing aid that may work when the ordinary type will not. I have devoted much thought to the problem of the seat of the sensitivity. I have evolved some ideas which I hope to do more work on soon. I would like to take the liberty of making some suppositions. Someone once said of Tesla, �Because he saw further, he saw first.� I think that many truths lie hidden behind barriers that only exist in the mind. I hope that these suppositions will be taken in the spirit in which they are made; that is, to stimulate thinking by those more qualified in these fields. It may be that the sensitive unit is the nerve endings in the inner ear. The nerve endings in the skin seem to be affected. It may be that it is not necessary to have conversion from electrical energy to mechanical energy to stimulate the hair cells in the cochlea which are connected with the actual nerve fiber endings. These are the sensory end organs of hearing. Maybe the reaction to electrical fields in these tiny organs is on an atomic level. If conversion from electrical to mechanical energy is necessary, there are many transducer systems that could be considered. Some chemical or anatomical difference in some individuals may create transducer properties to some part of the inner ear. If any part of the mechanical system that transmits the sound pressure waves by mechanical means to the inner ear for some reason was partly paramagnetic, diamagnetic or even had piezoelectric properties, they might be acted upon by electrical fields. For instance, the tectorial membrane or �roof� membrane which normally stimulates the hair cells when the fluid in the cochlea is in motion, could be set in motion by fields if it had some of the above properties. Suppose some of the bony material around the cochlea was a sort of dried out spongy mass with loose dielectric material. This might be set into vibration by fields, the sound could travel to the nearby organ of Corti by bone conduction. Maybe these fields induce tiny currents in the inner ear, and these currents stimulate the hair cells or even the nerves going to the brain. I think the last possibility is the most plausible so I would like to go into it in more detail. According to the membrane theory, the nerve fiber is polarized with negative ions on the inside and positive ions on the outside. The membrane is semi-permeable to these ions. If the membrane semi-permeability breaks down, the polarization breaks down. In either case, the breakdown is progressive along the nerve, and this is the nerve impulse. The recovery of the semi permeability and polarization along the nerve follows behind the nerve impulse, and the nerve becomes ready for another stimulation. Any current reaching the nerve will depolarize a region and start the impulse to the brain. If the nerve for some reason in some individuals is not as well insulated from these currents as in the normal individual, or if the cochlea is not as well insulated from these currents in some individuals, perhaps this could make them sensitive to these electrical fields. This theory would also help to explain the three types of sensitivity as electromagnetic fields can induce electric currents in the tissues; electrostatic fields can cause currents by movement of charges; propagated radio waves can induce currents as they pass through the body. If these currents activate nerves in some people, they could cause suffering as this woman has suffered. Perhaps many more are suffering from these effects. When you consider the electrical makeup of man and the continuously increasing fields we are subjected to, it seems more reasonable to me that this phenomenon would occur rather than not occur. I believe there could be an increasing incidence rather than an isolated few. In April 1963 I received a letter from a woman in Brooklyn, New York. She has been trying to find help in a case like this. She described the same sort of trouble that the other two women had. I sent her instructions for some tests, a tape of the noises and some questions to answer. From the answer to the questions and tests, I believe she may possibly be another sensitive person. She said that the recorded noise was what she heard. I recently talked to nurses that had worked in mental institutions. They described patients who were always complaining and trying to get away from the terrible noise. Cotton in their ears did no good but certain rooms or areas were more quiet for them. I believe that it may be possible that some people may have been driven to these institutions because of the unbearable noise and other effects, if they are sensitive to the fields. Maybe we are putting them in a worse field area. Maybe they could be helped by finding out if they are sensitive and if they are, placing them in a field free area may help their condition. I believe this is a vital thing to consider in this age of increasing mental conditions. Now we will explain what we found to be the source of most of these fields in this situation and we will explain what was done to improve the condition. The method of power distribution is about the same all over. Power is distributed by three phase alternating current systems. In the area in which we worked, the high tension feeders fed three-phase star connected transformers. The secondary voltage being 4160 volts between any two of the three leads of the star connection and 2400 volts between any one of these three leads and the grounded neutral of the star connection. This is a typical system. One of these three phase leads will go to one area with the grounded neutral and will serve and feed a number of 2400 volt 240-120 volt transformers for subscriber service. They are now called primaries. Another three phase primary and neutral goes to another area and the third goes to another. (Fig. 1.) These areas may be adjacent, overlap, or may be on top of each other. Now you have three areas that have 4160 volts potential between them. They are insulated from each other by the insulation between primary and secondary of each distribution transformer in these different areas. However, there is a certain amount of electrostatic capacity between each primary and secondary of each transformer. In other words, each transformer is a small capacitor or condenser. This capacity is too small to pass much 60 cycle current, but at high frequencies it can pass a lot of current. However, 60 cycles is not a true sine wave in power systems. It is a distorted 60 cycles which means it is a combination of 60 cycles and higher harmonics of 60 cycles. These high frequency harmonics will readily pass through the small transformer capacity between primary and secondary. We might add at this point that an understanding of this analysis of power distribution harmonic field problems can be of help in any laboratory where interference is affecting certain delicate instrumentation setups. The distortion of 60 cycle waveform is the result of many factors. Generators may produce poor waveform or motors on the circuits may cause harmonics because of the air gaps in the armature slots. Transformers may produce harmonics depending upon the degree of saturation of the core. Rectifiers may produce harmonics. Series and mercury street lighting systems can cause troubles. These triple-harmonic currents are transferred from primary to secondary of the distribution transformer by induction the same as the 60 cycle current. The 240 volt center tap is grounded at the transformer and to the water pipes in the house so one side of the 120 volt circuits in the house is common with the piping and the pipes can carry currents that will set up fields. 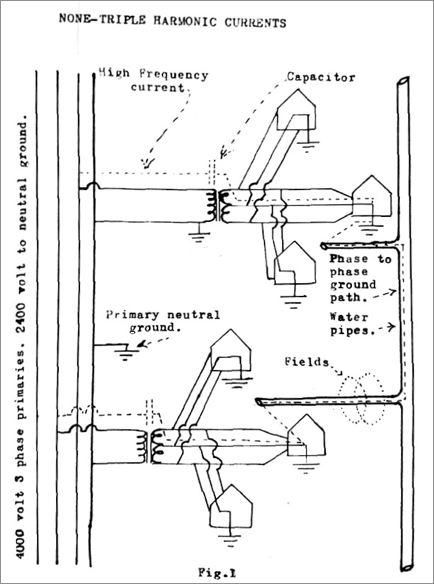 These triple harmonics on the 2400 volt primaries are seeking a ground return so they are capacity coupled from primary to secondary and into the house where they radiate strong electrostatic fields and the current enters the piping system creating electromagnetic fields. In speaking of these harmonics, we of course do not mean that all of them are present. Only some of these are predominant depending on what is causing them. For instance, the 150th triple-harmonic of 9,000 cycles may be a predominant one in a certain case. In communication work it has been found that these triple, residual, or unbalanced currents can cause as much interference as 40 times the currents in balanced systems, and as much electrostatic interference as 110 times the voltage in balanced systems. Now let us consider the source of fields which are hardest to track down and analyze. These are the non-triple harmonics which normally circulate from one phase to the other with the 60 cycle power current in a balanced way without ground return. However, they do get into ground paths in the following way. Remember we said that the three phases may go to three separate areas in a distribution system. These three areas are interconnected with common water pipe, gas pipe, or other conductors. Each area is at 4160 volts potential difference because of the electrostatic capacity coupling from primary to secondary of each distribution transformer. The center tap of each secondary is grounded to water pipes in each particular area so the interconnecting pipes carry these non-triple harmonic currents between phases. These pipe currents create the fields. (Fig. 1.) Also, all grounded objects have an electrostatic field between them and any �hot� wire near them because the ground is common between the phases. At this point let me illustrate. If you have an ordinary �zip� lamp cord that is connected to a load, you have both 60 cycle and harmonic current passing through it, but little electromagnetic field around it because the conductors are close together. The fields cancel because they are in opposite directions and they envelop each other. One of the cord wires is also at ground potential so the electrostatic field about the �hot� wire is partly shielded by the grounded wire, and there will not be much electrostatic field. Now if you �zip� apart this cord you will have a very different condition. Each separate wire will have a strong electromagnetic field about it. In a situation where you have these harmonic currents taking a ground or pipe path away from the other conductor, you will have strong fields. If you separate the two zip cord wires, you will be forming a loop. The field will be stronger in the loop because it becomes a single turn inductance coil. Water pipes can also form a large loop around a certain area. If you check these separated wires for electrostatic field, you will find that the �hot� wire is no longer shielded by the grounded wire, and it will be radiating a strong electrostatic field. In the vicinity of a single three-phase primary in one area you will have non-triple electrostatic fields because the ground is common with the earth in another area fed by another phase. The triple harmonic electrostatic fields are present around all three feeders whether they are separated or not because they are in phase on all three with grounded neutral return. Also, the electromagnetic fields are stronger because of ground return paths. There are many puzzling conditions if the overall picture is not clear. For instance, an electrostatic probe will seemingly indicate that trees, bushes, and any grounded objects have these electrostatic fields about them. They simply become part of the conducting path through the instrument. In checking fields around buried pipes for instance, we have come to a �T� with one pipe branching into two. One pipe would have a very different sound than the other. One branch would be conducting mostly non-triple currents between two different phase areas, and the other mostly triple harmonic currents to a three-phase neutral ground somewhere. The third would have both. Some of the measures taken to reduce the noise level in the house will now be given. The kitchen was the noisiest room so that was investigated first. Electrostatic fields were strongest. The open wire low voltage door chime wires in the attic were radiating strong electrostatic fields because they acted as an antenna or an ungrounded radiating surface. This radiator was coupled to the source of harmonic voltages through the primary to secondary capacity coupling in the bell transformer. Grounding one side of the low voltage stopped this. Grounding all electrical equipment such as the freezer box removed more. The telephone was also bringing in noise so with the cooperation of the telephone company, the entrance wires were replaced with shielded wires which helped more. Ungrounded fluorescent light fixtures in other rooms were grounded. This procedure was followed throughout the house to remove most of the electrostatic trouble. The electromagnetic fields were much more of a problem because they cannot be stopped with grounded shields of the ordinary type. Also, grounding out static fields added more currents to the grounding system, adding more magnetic fields! The swimming pool was the best ground in the area, and strong currents were going to it so it was isolated from the house with insulating pipe bushings. Through the cooperation of the water and gas companies, the entrance pipes were isolated from the house. All of this reduced the pipe currents in the house. The next line of attack was outside of the house. We asked the electric company if they would have a special transformer wound with an electrostatic shield between primary and secondary. This was done and they also cooperated in moving it further from the house. In the bottom of a creek bed below the power pole a six foot deep trench was dug about ten feet long in mostly rock. Sheets of copper were laid in the bottom and connected to heavy copper wire running to the pole transformer. Many bags of salt and charcoal were emptied into the hole and then it was filled with dirt. This was kept wet. The idea was to obtain the best possible ground that would be better than the house ground and remote from the house. The shield between primary and secondary of the transformer, and the case were connected to this ground. Secondary neutral was also connected. This project resulted in the interception of the non-triple harmonics which could only get in through the capacity coupling in the transformer. The capacitively coupled component of the triple harmonics were also intercepted and shunted to the new ground away from the house. This left only the inductively coupled component of the triple harmonics going to the house. These set up local conditions because the 240 volt center tap grounded system is split into two 120 volt circuits serving different parts of the house. Between the �hot� wires of the two circuits you have electrostatic conditions. For instance, the thermostat low voltage heating system controls were on one circuit, and the door chimes were on the other. Between these two open wire circuits there were strong electrostatic conditions. The thermostat and bell transformer secondary was grounded at one terminal to remove the static fields. Now the common ground was conducting these currents and setting up magnetic fields. It seems like you can�t win! However, this was less than the overall noise level found around the whole house and property from more remote sources, so the next step was to track these down. All of the water and gas lines in this area for many blocks around were checked with the coil. Telephone lead cables and carriers were conducting high currents. Current up to five amperes were measured in cables and pipes with clip around AC meters and by breaking pipe connections. 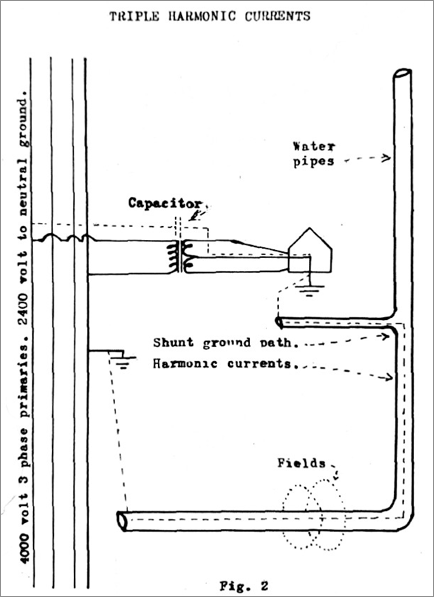 The most valuable tool devised for this work was a portable automatic cycling switch or contactor with long heavy leads that could be clipped onto pipes or wires, to alternately make and break a cross connection or make and break certain pipe or wire disconnections. We would turn this on and then go back to the house to listen for changes in the noise. The interrupter was made so that the closed circuit period was longer than the open period so that we could tell which way the noise was loudest. Some of these effects were heard with the interrupter miles away. The subject in the house also noted these changes. A noise generator was also used with this switch to alternately add noise to a pipe etc. During an electrical storm, the power to most of the city was knocked out for a few moments. I was at home when this happened. I went to the phone to call this woman to see what effect it had. Before I could call, she called me. She said that she was lying down resting when suddenly the noise stopped. She got up to see what happened and walked through the house. She was not aware that the electricity was off until she saw the clock had stopped. The small amount of noise remaining during the power failure probably was coming from an insulated, high pressure gas main running from Los Angeles to Goleta north of Santa Barbara. This line passes within 25 feet of the house and any pulsating DC cathodic pipe protection current would set up a field the same as alternating current. Pipe lines are protected from corrosion by electrolytic action by applying a low voltage DC current to the pipe of opposite polarity to the natural current so that iron ions do not leave the pipe to go to soil, but ions from the soil go to the pipe. This current is supplied by rectified AC current units spaced at intervals along the line. Some of these units could have been outside of the power failure area. Some incidental findings should be of interest to water and gas companies. I believe that AC currents may be a factor in pipe corrosion. It has been thought that only DC currents were a factor. I believe that AC currents could in certain possible ways find a path through the water in a pipe and, by electrolysis, break up the water into hydrogen and oxygen. The oxygen could very well be the cause of known pitting on the inside of water mains. In some cases you may have rectification of the AC currents due to oxides, corroded contacts or joints, or some condition that would create a rectifier. The DC then would present cathodic deterioration problems. This last paragraph does not negate all the work done on this project. It should instead create a greater challenge. All of the work gradually brought the noise level down to a degree where the subject could live with what was left. The problem was complicated by the fact that continual changes were taking place in the area. New houses were built, new services were installed. New water lines and power lines were installed. The pattern of ground currents was changing. The noise kept increasing so that after a couple of years the tenants had to sell the house and find a quiet area. In this paper I have tried to show that this phenomenon of �Human Sensitivity to Electric Fields� can exist. I believe that the source of fields can be traced, the method of distribution can be determined and some measures can be taken to reduce them if the need exists. I believe that this whole field from the physiological to the engineering investigations requires competent attention by those qualified to do serious work on the subject. A list of some of the equipment in this work would include the following: High gain battery operated amplifiers and tape recorders; a variety of electromagnetic coils and probes; a variety of electrostatic probes and ground conduction probes; high pass, low pass, band pass and resonant tunable filters; low frequency marine receiver; oscilloscope; signal generators; noise generator; megger; harmonic wave analyzer and DB meter; audiometer; pen recorder; clip around AC meters; a variety of special devices made for specific purposes and unusual conditions such as an automatic sequential switching device. We also used a lot of heavy copper wire, electrostatic shielding and some special magnetic shielding material. May we say that we had the fullest cooperation of the utility companies. A lot of money was spent, and many hours of work put in by electric power crews, telephone crews, water company crews, and gas company crews. In order to break up pipe currents in the area, the gas and water companies cooperated in putting insulated bushings at the meters of most all the houses in the area. The water company even broke a high-pressure 12 inch steel line at two places and installed insulating joints. This line ran between an upper and lower reservoir and was forming part of a large loop around the area. The electric company cooperated in making tests by disconnecting for brief periods some areas, by switching phases, by sending out engineers with special equipment to measure harmonics during tests such as shutting down rotary condensers at the substation. The phone company furnished a truck and a man to climb poles and measure and trace cable and cable carrier currents in the whole area. They also furnished components to experiment with resonant filters for the phone line. The gas company furnished men with radio communication to make tests by turning off and on remote cathodic pipe protection units. Cooperative neighbors allowed me to go through their houses and properties with test equipment. I hope that all of the findings on this project will in some measure compensate the cooperative companies for their material help. If this sort of case should arise again, I hope they can derive some help from what has been learned here. I am ready to cooperate with anyone wishing help. I also want to thank the Biology staff at the University of California, Santa Barbara, for their cooperation and understanding. On June 14th 1963 I talked to the Monrovia woman on the phone. She thanked me for the proof I was able to give her that what she heard was a real outside condition and not in her mind. Since this revelation she has been able to adjust herself to the noise. On June 18th, after the ISA Symposium, I went to Santa Barbara and made a tape interview with the subject of this paper. She expressed her desire to cooperate in any way possible in further studies. In this interview she mentions that a dog she had in this house could not stand the noise and became so ill he had to be destroyed. He always preferred a certain spot in the horse corral to stay in, the same spot the horse liked, also a spot she herself went to as it was much more quiet in regard to the field noises! This poses the possibility of using experimental animals in certain tests. Homing pigeons in races at times have been stranded on the house for days acting confused as to their bearings! It has been hard to understand their use of the DC earth field. However if they are sensitive to low frequency AC fields, movement of their wings in the steady earth magnetic field would induce AC currents in their body of the frequency of the wing beats. This could give them their bearings. She also said that she encountered a strange condition in a friend�s house. A certain hallway was completely quiet in a small area. This may have been a one in a thousand chance where the fields accidentally were in the right directions, strength and phases to cancel out each other in the small spot. It be unlikely that natural shielding would be able to do this. We did make some attempts to do this in the previous work by picking up the noise, amplifying it, reversing the phase and injecting these fields into the house to try to cancel the existing field. Some mediocre affects were produced in this manner, but the variety of directions of many fields made it difficult to use this as a solution. The subject at present is living in a location and house I would have picked with my equipment. The ground is damp and wooded instead of dry. It is on a steep hillside with no streets with pipes etc. below it. She is quite comfortable here. The subject has also had another bad time with symptoms she had before from fields. She developed an infection in the ears and lost most all of her normal hearing for a time. AC field noise, however, did not diminish. I am more convinced than ever that something should be done about these findings and so is the subject. She said that she considers herself fortunate that she could hear the noise because otherwise she would not have known what was causing her other conditions. She said the total body effect, feeling, pain etc., is worse than the sound! This article was published in 1963, but is still fully relevant. The electrical distribution system has changed little, and the same problems with stray electricity are still common. A major change is that electrical outlets now have a ground and electrical appliances have their chassis connected to the ground, so the electrical fields are often reduced. Another change is that today new residential gas lines and water lines are usually made of plastic and do not carry stray electricity. But today there are a lot more transients on wiring, including the ground wires, from modern electronics. In 1963 there were no switch-mode power supplies or compact fluorescent lights. The transformers that split the high-voltage primary into two 110 volt phases inside a house are still the same. This system continues to be used throughout most of North America, though it is now usually called �wye� instead of �star.� In Europe and elsewhere they have transformers that serve entire neighborhoods and have three phases going directly into the homes from the outside without a transformer serving just one or two homes as in North America. This was a very costly investigation. The utilities were very cooperative in sending out crews to help with the measurements, and apparently didn�t charge for that part. But it is unlikely they did all the modifications of the pipes and the transformer for free. The bill paid by the resident must have been quite substantial. This article first appeared in the 1963 issue of Proceedings of Biomedical Sciences Instrumentation, pages 467-475. The copyright expired in 1992. By United States law, works published in the years 1923 through 1963 were automatically copyrighted for just 28 years. The copyright could be extended for another 67 years if renewed during the 28th year. According to the U.S. Copyright Office database, no such renewal was filed for this document or the symposium proceedings it was published in. The website www.eiwellspring.org has extensive information about measuring and mitigating electromagnetic fields, as well as historical documents about environmental sensitivities.